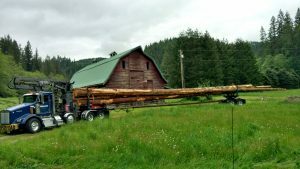 The Oeser Company manufactures utility poles from Douglas Fir and Western Red Cedar. If you are planning a timber harvest, and think that your timber stand may contain pole material, we would be happy to visit your site, at no charge and advise you as to the possible pole content and potential. Poles are a specialized forest product, and usually have a higher value than other logs produced from a typical timber harvest. The Oeser Company provides the option of pre-pole harvesting in situations that warrant this service. 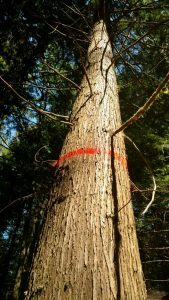 One advantage of pre-pole harvesting is that higher value material can be taken from your stand of timber with less impact to the ground and surrounding trees. With a site visit we can determine if this would be feasible for you. Poles require specialized trucks for hauling. For information on availability and costs, please contact us. Pole prices change with market conditions, for current or special pricing, please call. 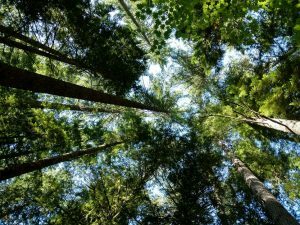 Experience in the forest products industry – Since 1996. With The Oeser Company – Since 1996. Experience in the forest products industry – Since 1975.